It’s been awhile since I’ve reviewed a pen and this one is long overdue. Life has been HAPPENING like crazy and I’m finding that my blog suffers when things get intense. How the weeks do fly by. 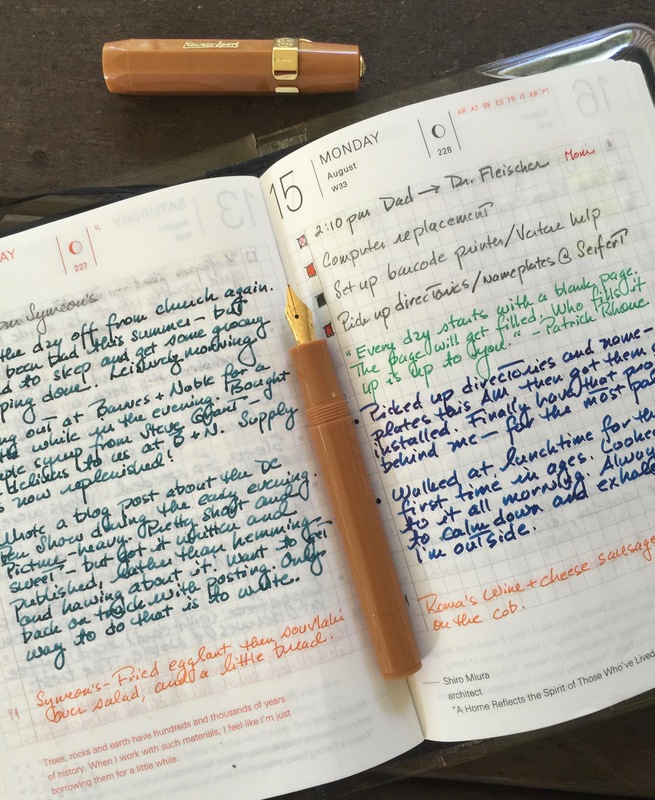 I’ve had this pen—this Fisher of Pens fountain pen (Ares model)—on my “to be reviewed” list from the moment I purchased it at the DC Pen Show in August. Because it’s a gorgeous pen, but also because it demonstrates why pen shows are so spectacular. We arrived to this year’s pen show early Thursday evening, just as the vendors were covering up their tables and heading out for dinner, so there was no shopping to be done that day. But Friday morning, as early as possible, we trotted down to the lobby to pick up our Weekend Trader passes so that we could get into the show as soon as it opened. Because I didn’t have much in the way of a wish list, I told myself that I’d “make the rounds” before making any purchases. I’d take my time, really scope things out, then circle back to buy the pen or pens that spoke to me. That was the plan. We stopped at Carl Fisher’s table almost as soon as we entered the show as he was set up in the lobby, prior to being moved to the large ballroom for Saturday and Sunday. I’d seen Carl’s pens on Instagram, but had never met him, nor seen his pens, in person. 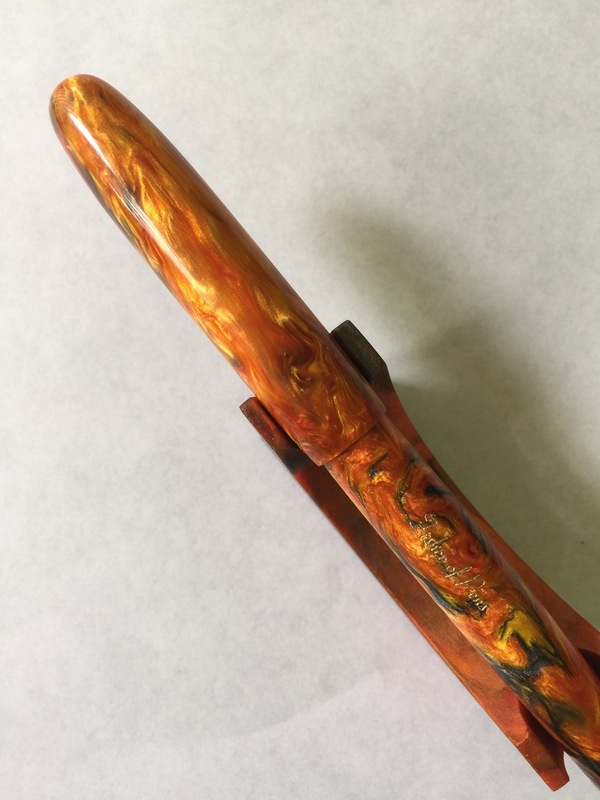 Anyone who’s seen the contents of my pen cases, knows I have a thing for orangey autumnal colors, so my eyes (and my heart) were immediately drawn to this pen and its delightful swirl of oranges, golds, and blues, with a slight shimmer that is neither too much nor too little. The sun streaming down from the lobby’s skylight gave this pen the best treatment it could ever have. Illuminated by that sunlight, this pen was simply stunning, radiant, and LIT UP. But I had that plan. My husband and I scoped out a few vendors in the large ballroom, but the whole time, my brain was fixated on that pen. So we circled back. Hi, Carl! Sorry I caught you with your mouth open. I acted all casual, spent some time oogling Carl’s double-ended creation (sweet! ), and was about to examine my heart’s desire a little closer when Mike Mattson of Inkdependence stopped at the table and OHMIGOD picked up “my” pen. My neck tensed. My heart stopped. My stomach turned over. Gulp. I conjured up all of my mental telepathy skills and beamed “DO NOT BUY THIS PEN! DO NOT BUY THIS PEN! DO NOT…” to him. I must have skillz, because eventually he put it down. HE PUT THE PEN DOWN. Phew. And I bought it. Immediately. Plan be damned. 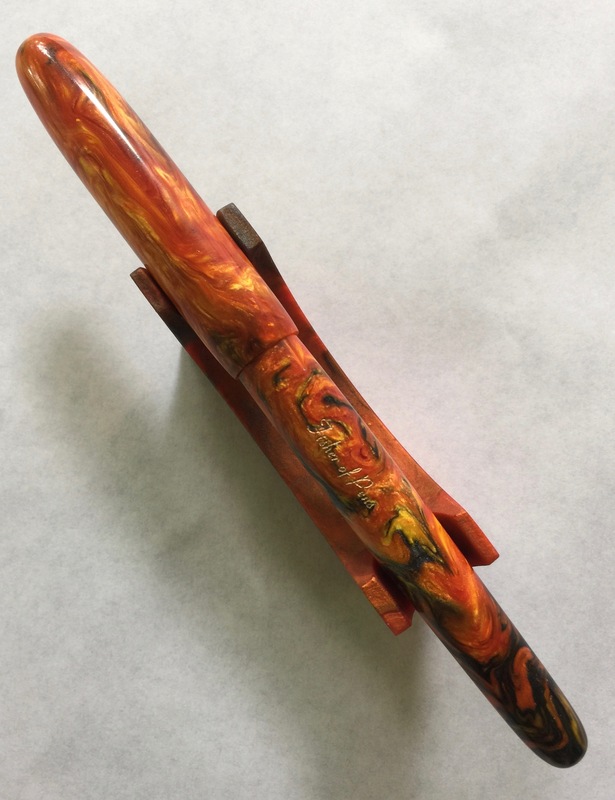 In talking to Carl, I learned that the material for this pen was made by Jonathon Brooks, of the Carolina Pen Company, which explains why it’s so stunning. Jonathon’s materials and pens are out of this world. I purchased one of his Charleston pens in a Combustion Acrylic at last year’s show and it remains a perpetual favorite. I should pause to add that both Carl and Jonathon are two of the nicest people you’ll ever meet—warm, authentic, and humble—while also being extremely talented pen makers. These two guys are my kind of people. On that Friday, Jonathon’s table was just a few steps away from Carl’s, so I stopped over to see him and to show off my purchase. When I showed Jonathon the pen, he high-fived me and said how pleased he was that I liked it. He also kindly offered me a pen stand he’d made that matched my pen. For free. I accepted, and thanked him for his generosity. I always enjoy talking to Jonathon and his wife, Shea. They feel like friends, even though we’ve only spoken at pen shows. One thing on my wish list was to have a nib ground by Dan Smith, my favorite nibmeister. I’d picked out the Tiger Stripey pen I purchased from Ken Cavers a number of years ago as the one that I’d have Dan modify to an Architect grind. My name was on his list and I was hanging around his table waiting for my turn as soon as he finished up with his current customer. At the last moment I decided to have the nib on my newest purchase modified instead. I’d had Carl install a two-tone medium steel nib (JoWo #6) on my pen, and Carl had tuned it to my liking. Smooth. Wet. It wrote just the way I like. But I’m somewhat addicted to Dan’s Architect grind and thought, why not just have him work on the nib while I’m at the show rather than sending it to him later. So that’s what I did. And now it’s fantastic. I’ve had Dan modify a couple of nibs to Architects and I love how they feel and look. This one is no exception. At the show, Carl had filled the pen with Montblanc Toffee Brown, one of my favorite browns. Once that ran out, I loaded it with the Akkerman #5 Shocking Blue I’d purchased from the Vanness Pens table, and the combination is a winner. The ink’s sheen shines through, and the color very nicely complements the blues swirling through Jonathon’s material. Nib grinding fascinates me. The pros, like Dan, make it look easy. Even working in sub-optimum lighting, he modified the nib on my pen to perfection. 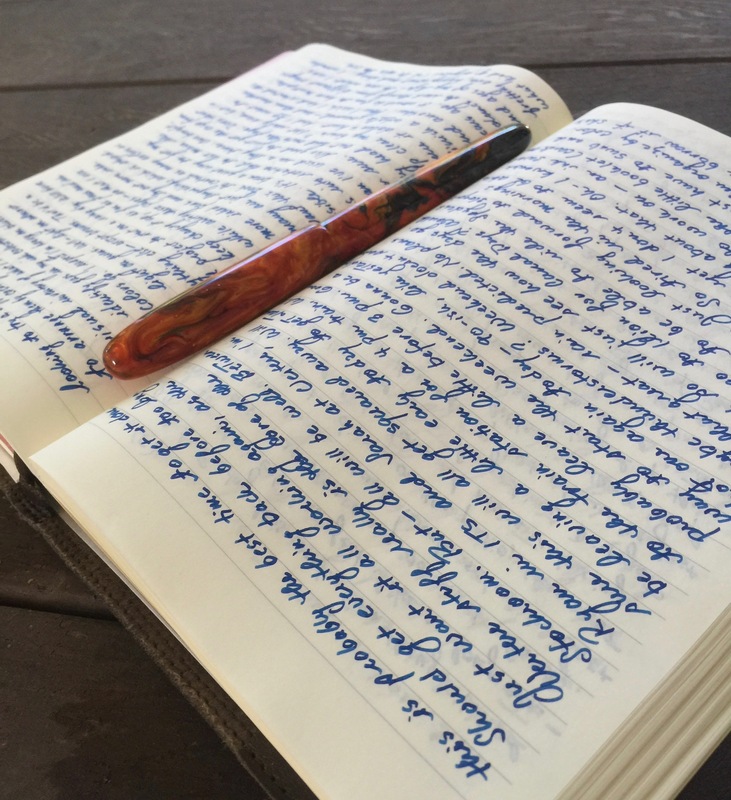 I absolutely love writing with this pen, not just because it’s a stunner in looks, but also in performance. Carl describes the Ares model like this—Stepped cap pen with a taper on both the body and the cap. Typically finished with rounded finials, this design allows for posting of the cap to the back of the pen during writing. My particular pen weighs 18.6 grams (12.1 g body, 6.5 g cap). Capped, the pen measures 15.5 cm (6.1 inches). Uncapped, the body measures 14.0 cm (5.5 inches). I use the pen unposted as its posted length is 18 cm (7.1 inches), which feels a bit long to me. Unposted, it’s great in hand. The Ares model takes a cartridge or converter, and can also be eyedropper filled. Those are the pen’s facts and figures. But facts and figures do not tell the story of this pen. Every part of this pen was touched by the skilled hands of a craftsman. And because it was purchased at the pen show, I was able to spend time with each of them, sharing laughs and handshakes and good feelings. I was also able to use my extraordinary powers of concentration to wrench it away from the hands of a rival buyer. You, too, can experience the high drama of competitive pen purchasing by attending a pen show! More thrilling than a rollercoaster! Guaranteed to get your heart pumping and the blood flowing! WHEEEEEE. Every time I look at this pen I hear Alicia Keys singing, “This pen is on fire!” (IT. IS. HOT.) While I’m hearing that song, I can’t help but think about Carl and Jonathon and Dan, each one playing his part to make this pen perfect for me. This is a Mary pen, if ever there was one—a pen that truly represents a collaboration of talents. The pen and the nib grinding service were purchased with my own funds. I was not compensated in any way for this review, and there are no affiliate links. Oddly enough, I’ve been recording all of that. Every day. 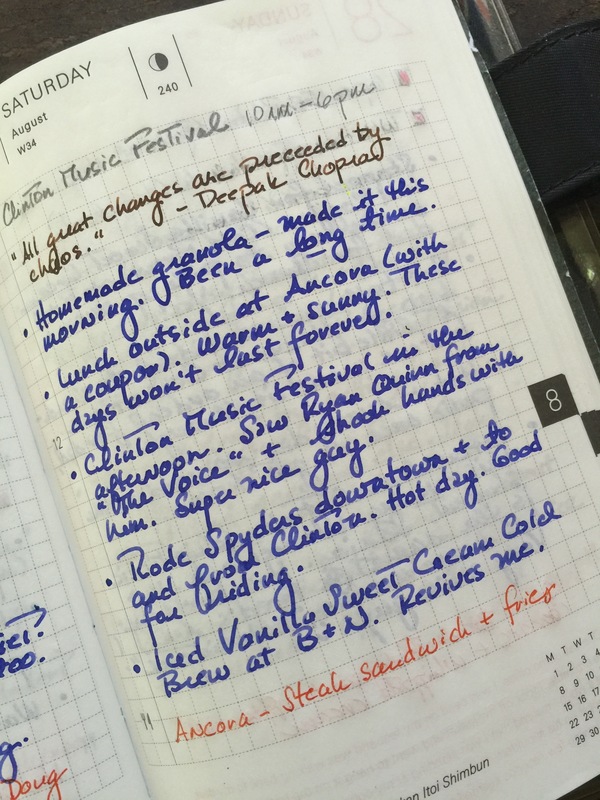 I have the world’s worst record for consistently journaling. The bottom of one of my filing cabinets contains stacks of partially filled notebooks. I used to write a complainy blurb, then let seven or so years go by before I felt moved to record another paragraph. On the plus side, this makes a notebook last a really long time, but, on the other hand, it doesn’t make for insightful or inspiring reading. The Hobonichi Techo and I just clicked. I worried that the size might be too small, but it’s proven to be just right. Filling up a page doesn’t take long, yet I can get in a lot of detail about my day and all of the good things that happened. No complaining allowed in this book. I’ve also taken to recording quotes that I come upon, usually on Twitter, often by Anne Lamott. 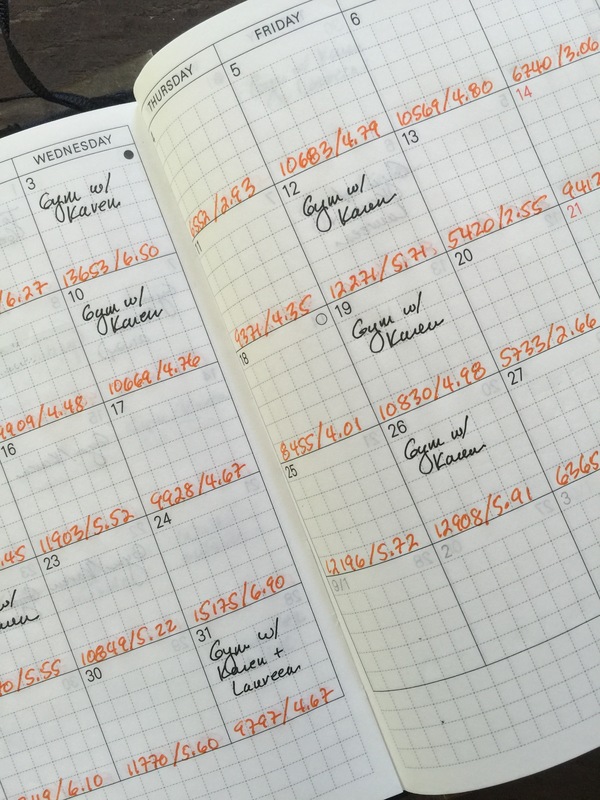 On the monthly pages at the front of the book, I’ve continued to record exercise details—gym visits, step counts, and mileage. Thanks to the Whole Life Challenge, and the support of a very good friend, the gym has become a place I enjoy even when I’m breathing hard, sore, and soaked. For someone who dreaded every moment of gym class in school, this is yet another miracle—another habit that has taken root. I’m learning that habits are like that. Sustaining the first habit makes it that much easier to stick with another one, and another one after that. 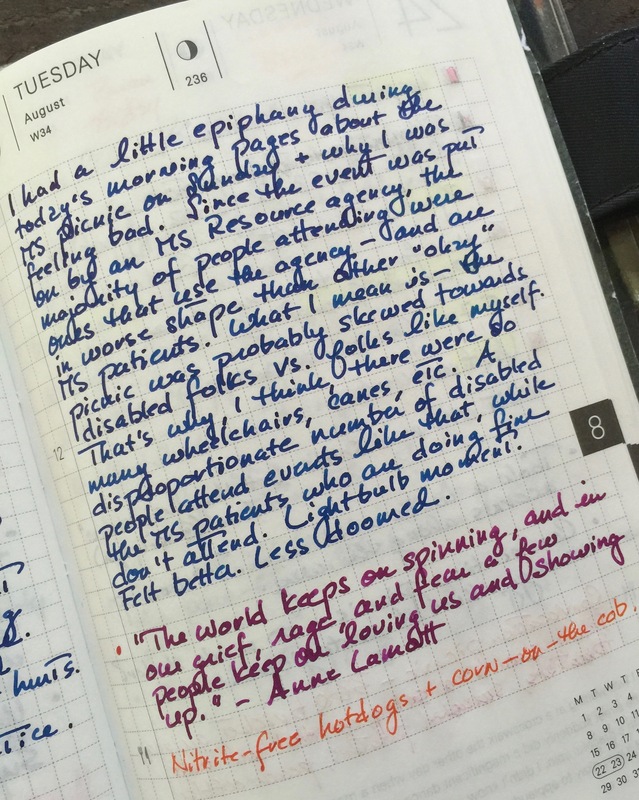 Full of quotes that buoy me up, details from my day that I surely would’ve forgotten, little epiphanies, and dinner ideas, the 2016 Techo has already become a treasured resource. I love leafing through it, seeing different inks, and moods, and blessings. I can’t imagine life without one. The 2017 version is already waiting in the wings. At the end of June 2016, I made a decision to FINALLY get out of bed to sit at my desk to faithfully write Morning Pages. As I’ve said before, this is an idea I’ve toyed with for years, but never put into practice. I was always too lazy, too tired, too full of excuses. Finally I decided to give it a shot. June 25th, 2016—a new habit was born. Now I can’t imagine my life without this practice. It’s been three plus months and though I have to get up at 5:30 am during the week to get to work on time, I look forward to writing these pages every single day. I dump anything and everything into this Nanami Paper Seven Seas “Writer” journal—dreams, worries, conversations, inspiring moments, petty complaints, joys, and anxieties. There’s not too much of the “we did this, we did that” kind of stuff, though, of course there is a little of that. What’s so cool is that I usually sit down with little idea of how I’ll fill the lines and pages, and yet there are always words. There are always ideas and problems and moods and feelings. I used to write three pages a day, but I’ve recently scaled back to two so that I have enough time to do ten minutes of meditation followed by five minutes of stretching before I jump in the shower. Meditation? Stretching? More habits? Who am I? The idea for a Jar of Awesome also came out of the Whole Life Challenge. While some on my team found the practice to be “hokey,” I loved it. As I wrote back in June, the thought of having the jar fill up with special moments from the day seemed like a great way to notice how much goodness there is in our lives, much of which would zip on by if we’re not looking for it. So I started a jar and have it sitting on my dresser. I will admit that this habit fell off my radar for awhile until recently, when I was listening to Elizabeth Gilbert on the “On Being” podcast. She spoke about her Happiness Jar, and I vowed to revive the practice. It takes less than a minute to write down something from your day that made you smile, something that will be nice to remember when you’re having one of those days. So I cut up some paper into strips, and have the strips and a pen sitting right next to the jar. I’m still not super consistent with this habit, but it’s one I want to continue to cultivate. I want to see this jar STUFFED with the tiny but wonderful things that accumulate as we go through our ordinary days. I want to get better at noticing those things even in the days that leave me feeling wrung out and run over. Habits. I was never very good at sustaining them. But look at me now—journaling, exercising, meditating, stretching, looking for the good in each day. One habit made the next one seem possible, then the next one, and the next one. Habits. Practiced day by day. Words. Feelings. Recorded letter by letter, line by line, page by page. I’m writing. I’m living. I’m grateful. I can think of no better use for my pens, paper, inks, and notebooks than to express that. I’m currently participating in a weeklong Social Media blackout, the latest Whole Life Challenge lifestyle challenge. I normally post a link to a new blog post on Twitter but can’t do that without losing points. If someone reading this could post a link for me, I’d be…you guessed it…grateful.